Diane Wasser Coposky and/or Deanna Hoppel. This cemetery was photographed in 2012 and is currently in the process of being updated. 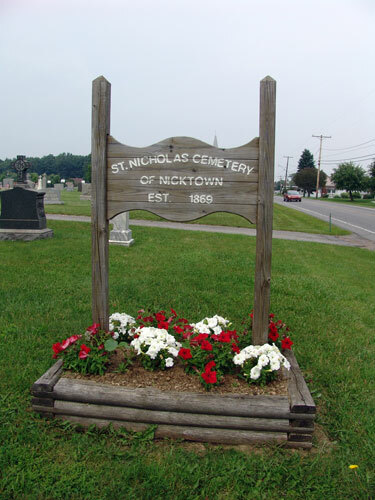 St. Nicholas Cemetery is located next to St. Nicholas Church, which is off Route 553, in Nicktown, Barr Township, Cambria County. This document makes no claims to being all-inclusive. Names included in this document were taken from several sources. This was originally a personal reading of St. Nicholas Cemetery, done in 1990. Information from headstones is marked by (H). Information provided from church records is marked by (N). Family records (FR) provided information on a number of individuals (this is a major family cemetery). Obituaries (O); in addition to listing information for an individual's obituary, information has been cross-matched to other individiauls (Of). A number of stones were worn, with names and/or dates difficult to read or totally illegible, with no discernable lettering. No attempt was made to do a rubbing of any stone. Any information labeled (H-worn) should be considered suspect. A review of the Cambria County Death Registers (DR), 1893-1905, from the LDS library, microfilm numbers 1293475 (1893-1895) & 1293476 (1895-1905), provided names, dates & relationships. In many instances, names listed in the Death Registers appeared to be spelled phonetically. A review of the Cambria County Marriage Records (ML) provided last names of women, names of parents, & in some instances, the death dates of previous spouses. A review of Rev. Albert Ledoux's five volume "Catholic Vital Records of Central Pennsylvania, 1793-1869" (LB). Social Security Death Index (S). St. Bernard Catholic Church, Hastings, PA, 1990 Mass Book (MB). If a man & woman were listed together on a headstone, & the years indicated they were old enough to have made it to adulthood, unless it was otherwise indicated, the assumption was made that they were husband & wife. So while most of the people listed in this document as husband & wife are in fact that, it is possible a brother & sister listed on the same headstone are shown as married in this document.